This afternoon, my boy will be receiving his awards as Fifth Grade Gold Medalist. I'm so happy and overwhelmed because it's a validation that my sacrifices in being a full-time hands-on mommy did not go to waste. Really, I am so blessed and thankful! 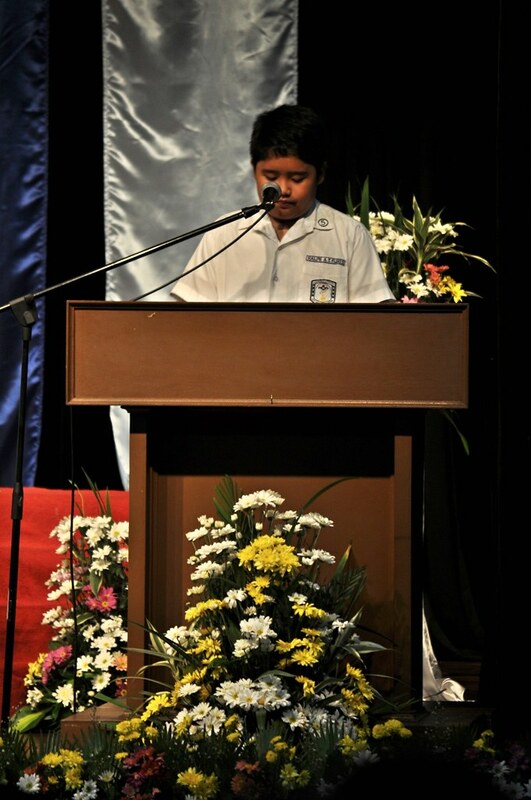 Since the fifth graders are the oldest awardees this year, he got the honor of giving the inspirational message to everyone. I'll surely be busy till this evening attending the ceremony and having dinner with the family so, for the meantime, I'm sharing to you his speech below. Reverend Father Edmundo A. Tiamson, O.F.M. Cap., our Rector; Rev. Fr. Alberto S. Poblete, our Vice-Rector & Campus Minister; Ms. Maria Cecilia A. Michael, our principal; Ms. Melissa Flores, our Assistant Principal for Academics; Mrs. Ana Bolinao and Mrs. Pearl Buenafrancisca, our APDs; administrators, teachers, parents, fellow schoolmates, good afternoon! Today marks another milestone in our lives as Lourdesians. It’s definitely overwhelming to see all our efforts recognized. All those hours spent studying for quizzes and exams and answering homeworks have paid off. The awards that we will receive are proofs of these. Nothing can be achieved/ without hard work! As to what Thomas Edison said, “There is no substitute for hard work.” I truly believe that he is right. To our teachers who taught us and looked after us while we are inside the school, thank you very much! We may be a little naughty, but we really look up to you as our mentors and guardians. Thanks for being always patient and untiring with us students. To our retiring teachers, we will surely miss you! I hope you don’t forget us because your teachings will always be in our hearts and mind. To our parents, who have worked so hard so you can send us to this good school, “Thank you, po!” We know that a huge chunk of your time is spent in making sure that a good future will be ours. Someday, when we are all grown up and working, we will also make sure that you too shall have a life that’s relaxing and pleasant. To our fellow Lourdesians, who have made this school year fun and memorable, thank you! The time that we have spent in learning and playing in the school have made our studies more inspiring. I should know because, as an only child, I consider you all as my brothers and friends. Finally, to God, Mother Mary, St. Francis of Assisi, and St. Pio of Pietrelcina, thank you very much! Thank you for always keeping us safe from harm. Thank you also for helping us with all our lessons and exams. Thank you for sending to us our teachers, parents, and schoolmates who have helped in molding us into who we are today.... achievers! Thank you and congratulations to my fellow awardees! congratulations mommy for a job well done and to your bright son. Wow! So many, nakakalula! Congratulations to you and to your son!